Small Kids Ride for Free! 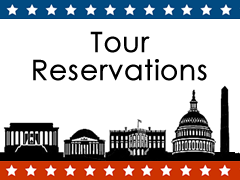 We will confirm your tour reservation promptly by phone or email. 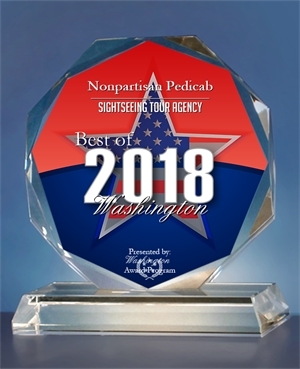 #2 out of 158 Tours in Washington. We're trying for Number One! Don't take our word for it, read what satisfied customers think. Safe, convenient and affordable transportation to the best destinations. Small Kids Ride Free ! Add a sense of fun to any occasion. 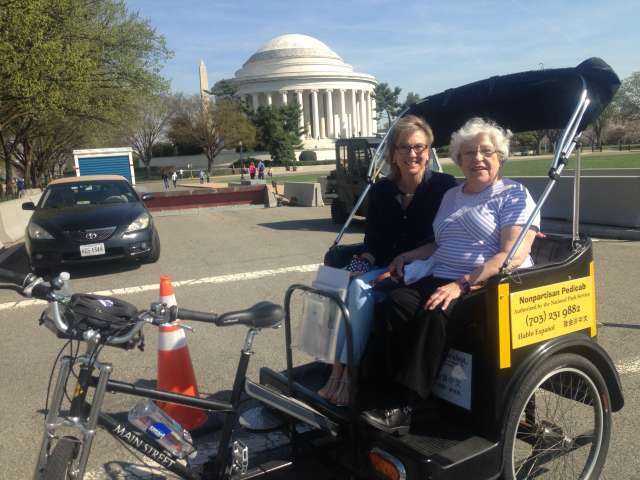 Pedicabs are perfect for the elderly and people with mobility issues. Easy curbside entry without steps, and we can get in close to venues that buses can’t. We easily accommodate strollers and folding wheelchairs. Don't leave your pet behind. We're happy to have them come along and we will keep an eye on them while you go into the memorials and monuments. 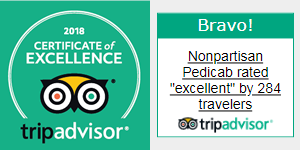 Five-bone rating from BringFido reviews. FREE Pick-up from any downtown location. Hablo Español. Bienvenidos a Washington! 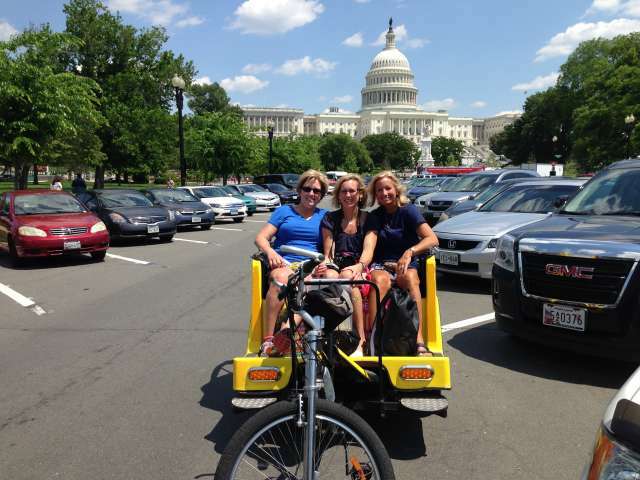 Why Choose Nonpartisan Pedicab Tours? 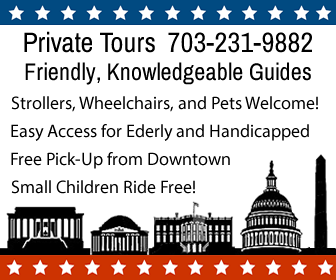 Because it is a great way to visit the National Mall, Monuments, Memorials and Museums ! Personalized Tour With A Friendly, Knowledgeable Guide! Start And Finish On Your Own Schedule! Free Pick Up At Any Downtown Location! Economical Use Of Your Time And Energy! Get Dropped Off At The Location Of Your Choice! 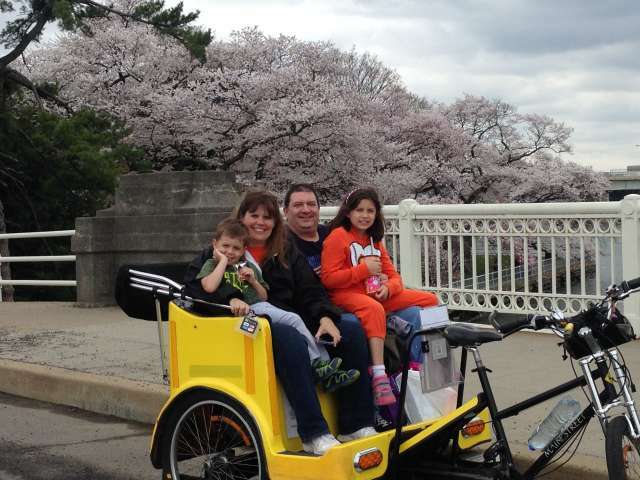 So Much Better Than Bus Or Segway Tours! 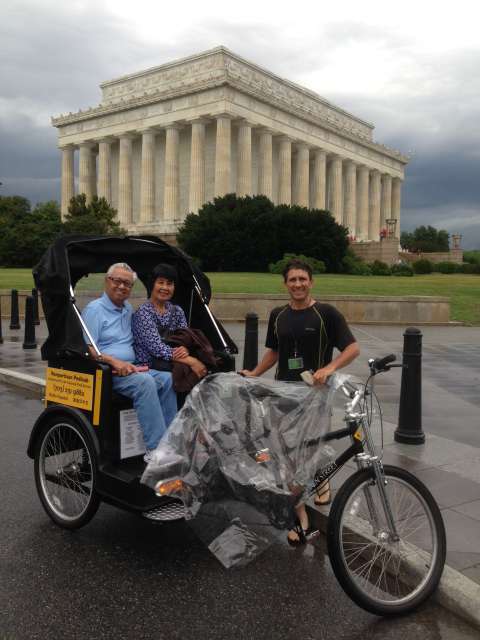 Nonpartisan Pedicab is owned and operated by Robert Hart an experienced, professional pedicab tour guide. 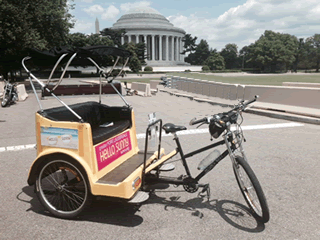 We provide pedicab transportation and tour services on the National Mall and throughout Washington, DC. 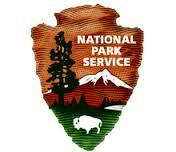 The operation is fully licensed by the National Park Service to operate on the National Mall. This permit, called a CUA, requires $1,000,000 worth of liability insurance. Robert is also a multilingual guide, speaking both Spanish and Mandarin Chinese along with a smattering of other languages. We offer advanced reservations service, on-call pick-ups, packaged recommended tours, personalized customized tours, and special event services. 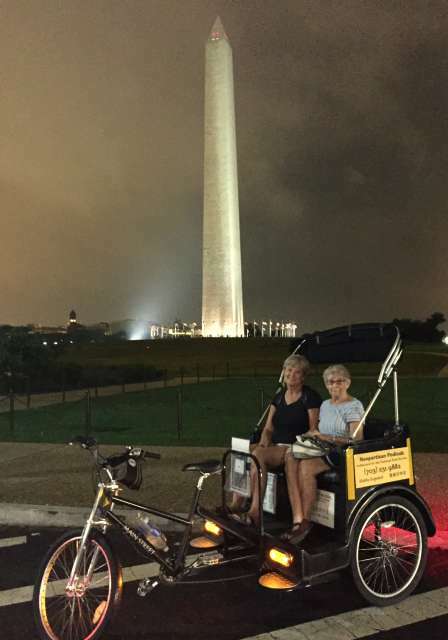 When we’re not showing our clients the best of Washington DC, you might find us cruising around the National Mall or waiting at dedicated pedicab stands located in front of major museums and monuments. Call us at 703-231-9882, or book a reservation with our Online Booking Service. 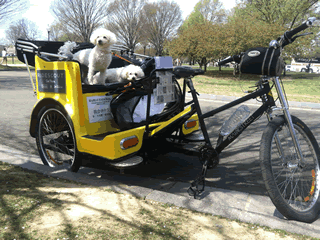 We know the National Mall like it is our own backyard (because it is!). 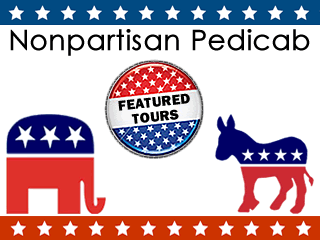 Join us for a memorable tour of the Nation’s Landmarks. 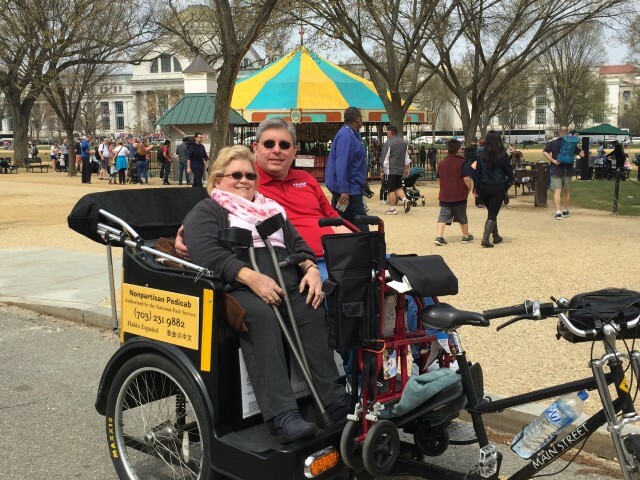 What is a pedicab? 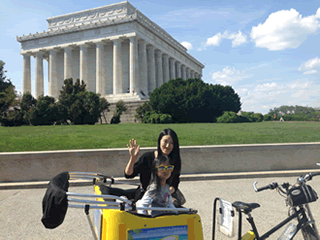 The Best Way to do Washington DC Sightseeing, of course! 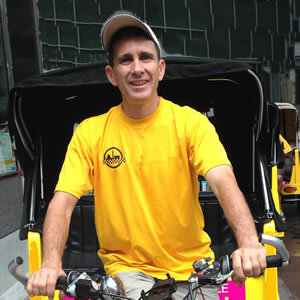 Pedicabs are human powered transportation that allows you to quietly and conveniently get up close to your destination. 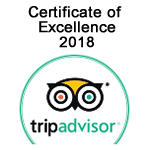 They can also have the added benefit of providing a professional tour guide that delivers a personal interactive experience that is just not available with other tours. 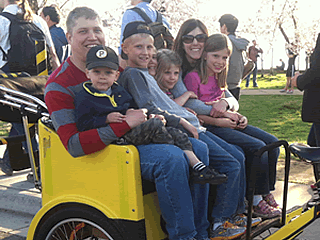 Up to 3 regular sized adults can be accommodated, as well as, folding wheelchairs or baby-strollers. They are ideal for the elderly or people with mobility issues. Group tours can also be easily arranged. 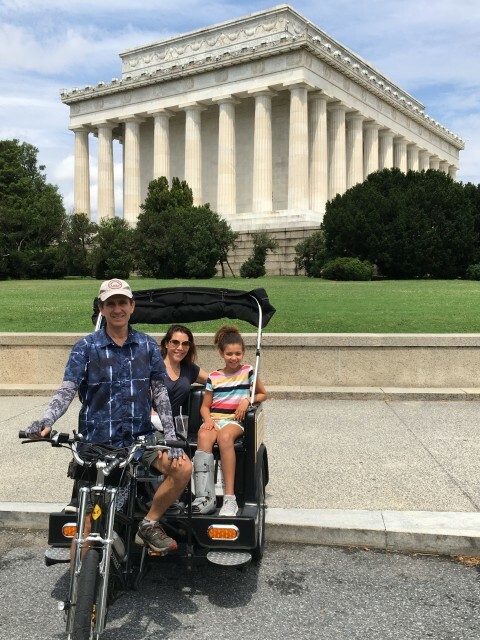 Many people come to DC expecting to walk all over — Smithsonian museums, Capitol, White House, Lincoln Memorial, Jefferson Memorial, etc. On the map, everything looks close. At some point, they realize that everything is actually spread out over a large area. People become exhausted and it takes a lot of time to walk around. When that happens many worthwhile sites get missed and people think about their aching feet rather than the national heritage. 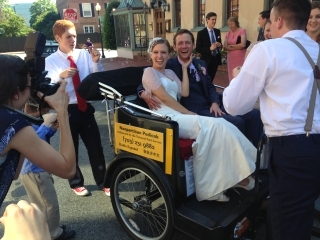 Hiring a pedicab is a very practical solution. Quick, convenient, comfortable and affordable. 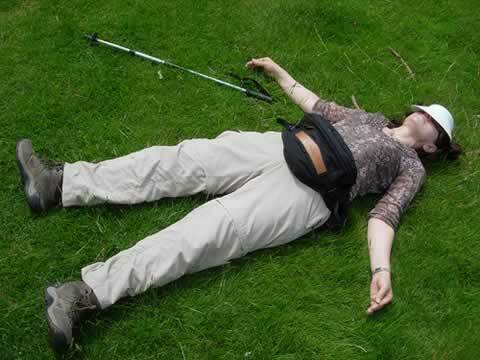 Walking long distances in the heat. Looks like more fun, right? A Segway Tour sounds like fun and adventure. But a trip to the emergency room can certainly ruin your vacation and using a Segway is definitely not as easy as it looks. It can be expensive and at least a half-hour of your tour is spent on safety training instead of seeing the sights. A lot of people abandon their segway tours and end up walking. Segways are cool transportation devices. Under the right circumstances you can see why people refer to them as possibly changing the future of transportation. But they are not all that great for touring the Monuments, Memorials and Museums. Unless you want to be a crash-test dummy. 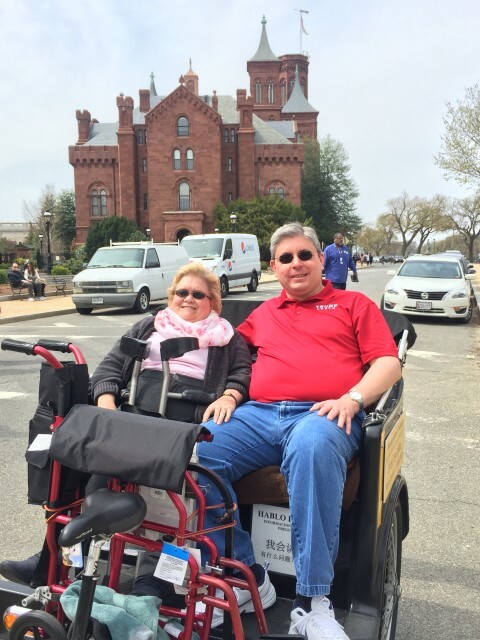 Custom, Personal Tour — Enjoy the sights at your own pace! Guide uses loudspeaker. No personal interaction with customers. No recommendations, nothing personal about it. No storage for wheelchairs or strollers. You’re out of luck. Where Can You Be Picked Up? How Much Time for a Tour? 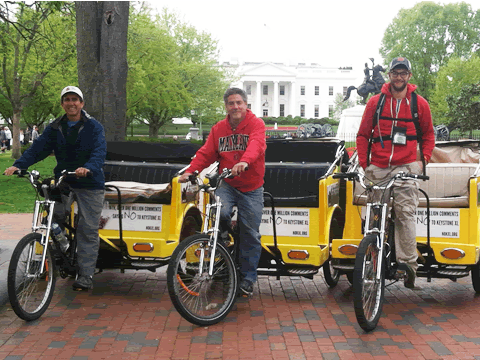 How Many Pedicabs Do You Need? Free pick up is provided from downtown hotels, museums, restaurants, Metro stations, and parking lots. If you’re not sure about your exact pickup location, tour duration, or tour pick-up time, that’s okay. We’ll discuss details when we confirm your reservation. 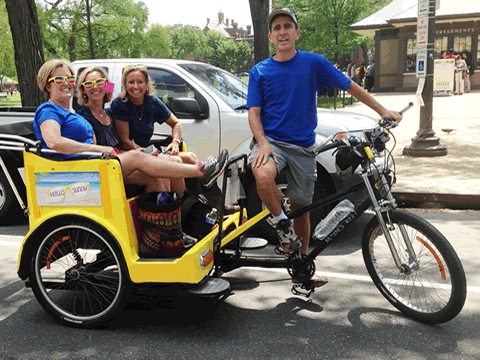 Pedicab tours are billed at an hourly rate starting from your pick-up point and reservation time. The final cost is pro-rated to the amount of time you actually spend on tour with us. 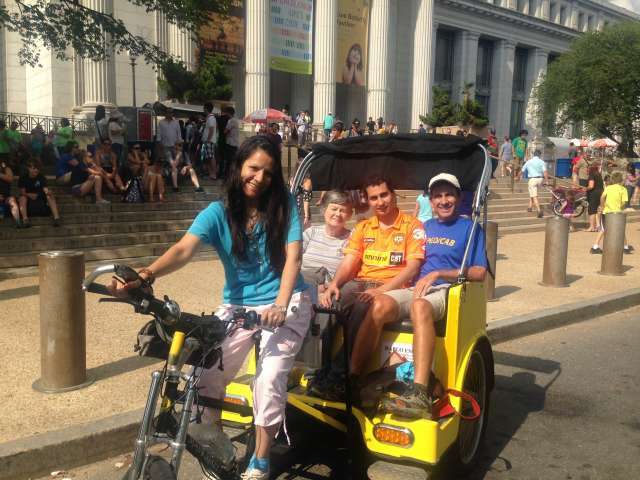 Rates are per pedicab and are calculated based on how many passengers will be in each pedicab. The price includes an experienced tour guide/driver as your personal chauffeur. No deposit is required. You can pay in cash or with a secure credit card transaction at the conclusion of your tour. A 5 to 6 mile loop around the national monuments takes about 1 hour of actual riding time. The amount of time you spend on tour depends on how many stops you choose to make and how much time you take at each stop. Are you unsure how much time you need on your tour? We extend tours all the time. We simply pro-rate the tour fee for the extra time you need to enjoy the ride. 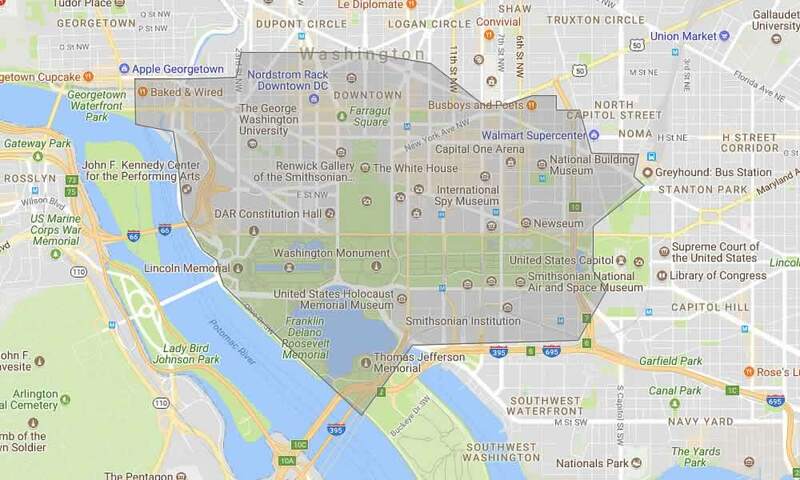 What to See in Washington DC?